Dental crowns are a type of restoration used to restore severely damaged or sometimes unsightly teeth. Crowns are much stronger than fillings and can have a better long term prognosis in certain cases. 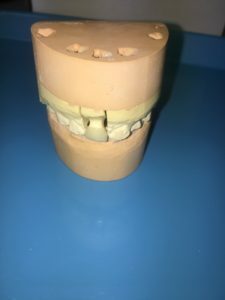 In general if a tooth has a broken cusp, incisal (biting) edge, massive tooth loss, or has had Root Canal Therapy a crown is most likely the best restoration. 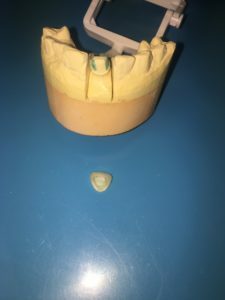 When a patient gets a crown at a dentist the dentist must first remove enough tooth to allow space for the crown, generally a minimum of 1-2mm thickness is required so that the material that the crown is made up is strong enough not to break from being too thin. 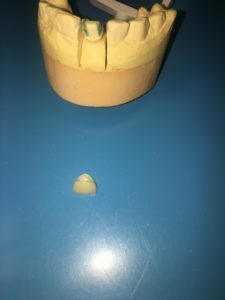 The different types of material that a crown can be made of include tooth color crowns such as Zirconia, Porcelain, Porcelain fused to Metal, and Resin as well as metal colored crowns which are generally made from Gold, Stainless Steel, or base metal. Completed crowns can generally give a beautiful appearance to teeth while providing great longevity. Many celebraties have had crowns or veneers (half crowns) put on most if not all of their teeth. If you would like more information on crowns, please contact our office and we will gladly answer your questions.